Maximum corrosion protection for the harshest of environments. Recommended for use in tropical wood, around pools, hot tubs, sauna, and sea-side type applications. What is this material? This product is made from Stainless Steel. 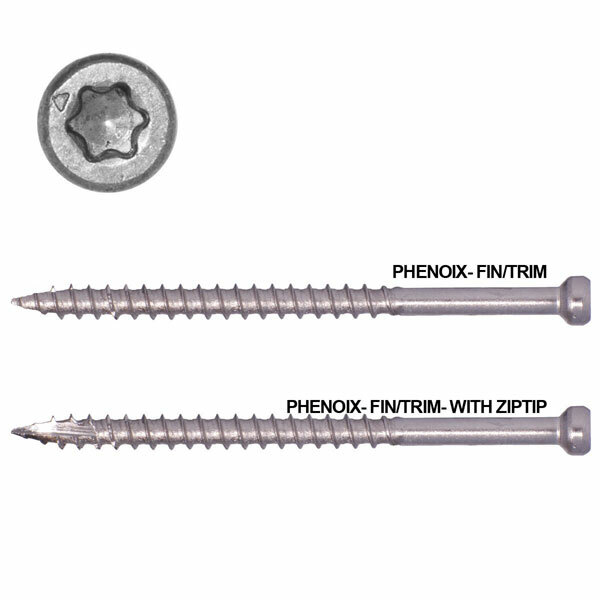 PHEINOX stainless steel screws are made from only the best grade of stainless steel wire, 305. The unique characteristics of the PHEINOX wire gives our stainless steel screws unmatched performance, by maximizing both torque and increasing bending strength. GRK's patented R4, RSS, Cabinet, FIN/Trim, and RT Composite screws are all available in PHEINOX stainless steel. Use PHEINOX screws from GRK for projects that should last a lifetime.GRK recommends the use of its PHEINOX stainless steel fasteners in tropical wood, cedar wood, pool, hot tub, sauna, and sea-side applications, as well as deck applications in areas with large daily temperature variances. The ultimate finish for superior all-weather corrosion protection.